Hello everybody and Tis Thee Season! I love Christmas and not only out of vanity to get presents and have my mom and dad spoil me when I go back home, but because of the cooking (oh a family and love blah blah blah) hehehe. This year some friends and I (who also happen to be my mom’s friends because I love geriatric people) are having a cookie decorating party and the annual Mother Daughter Bake-Off. So easy enough to say there will be treats! 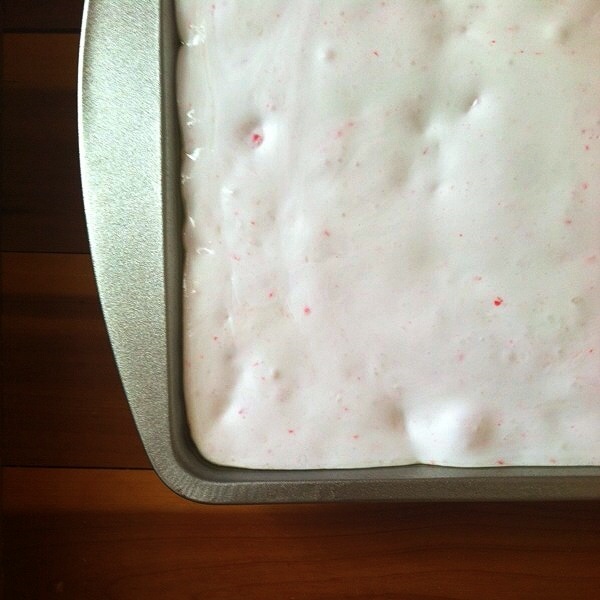 Behind the Scenes (BTS): This recipe is nothing new in my house. I’ve made these so many times that I don’t even need to look at the recipe. 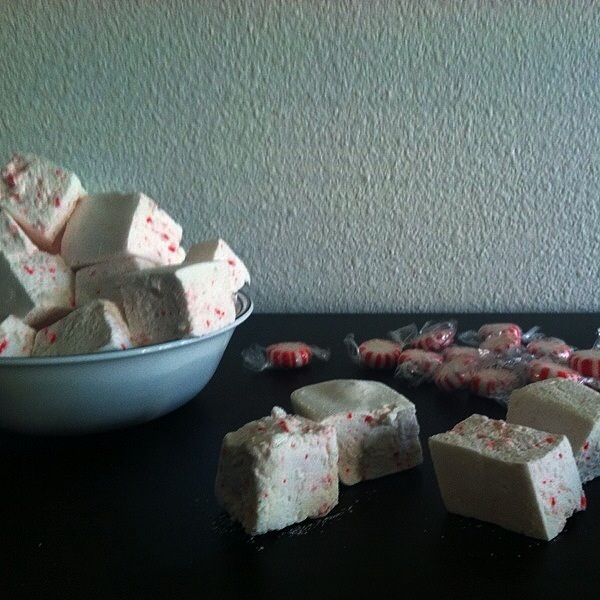 The only reason I don’t make them every week is because they are specifically Christmas time marshmallows and because the hammering of the damn candies makes too much noise and is a hassle. It literally takes me close to 45 minutes to hammer down all the candies; it might be because I lack muscle and arm strength but I have no problem lying to myself and saying they make candy too hard nowadays. 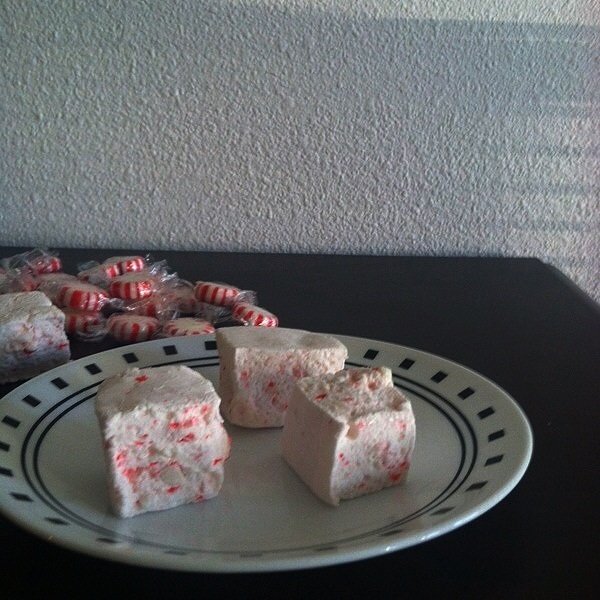 I first made this recipe a few years ago for my best friend’s Christmas Care Package; usually whenever holidays roll around we never buy each other gifts we make them because we’re broke and are two 80 year olds in 20 year old bodies. She’s an engineering major so her gifts to me are usually something that needs to be assembled and made (she obviously does that and then gives it to me) and me, because I bake, are usually treats (I’m also a Business major but it’d be really rude if I gave her financial advice for the holidays). Adjustments: I know you guys are looking at the recipe and saying “Ew raw egg whites, next recipe please.” You should first know that the hot simple syrup cooks the egg whites and that if you’re still worried about it you can buy pasteurized egg whites. If you’re going that route then 1 egg white equals 3 tablespoons (30 grams), so if you’re doing the whole recipe and not cutting it in half you’ll use 6 tablespoons (60 grams) of the pasteurized egg whites. Also most marshmallow instructions tell you to keep it in an airtight container, this really isn’t the case with these marshmallows, since there is peppermint candy and not simply peppermint extract in the marshmallow and because the marshmallow is moist keeping it closed up container cause the candy to water down and melt; it won’t make the marshmallow melt it will just be very sticky, but everything will keep it’s shape. I suggest putting it in a container and lightly covering it or putting it in a ziplock bag and not zipping it up. If you do happen to close it and it starts to sweat this is no big deal once it’s out of the bag for a while and gets some air the candy will become firm and solidify up again. Another adjustment is the mixing time, I’ve heard plenty of times that you have to mix for 15 to 30 minutes but that’s never been the case for me, maybe it’s because I beat the mix on high or the recipe I use and the adjustments I’ve made to it, but after about 10 to 15 minutes top the marshmallow mix is ready to be put in the pan. 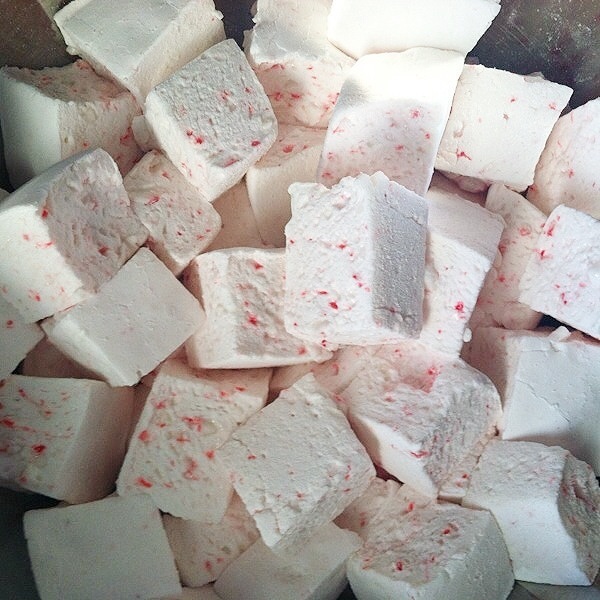 Other ways to know when the marshmallow mix ready to be put in the pan is to see how thick it’s gotten; when the mixture has almost tripled in size then it’s done. If the mixture has gone from that slight auburn color to white, it’s done, and if the mixing bowl has gone from hot to slight warm almost room temperature, its done. Sometimes I use all three as determinative factors, but after so many years I also just know. Helpful Hints and Suggestions: I know a lot of people tell you to cover your pan in powdered sugar and cornstarch and you can but I like to grease the pan with cooking spray and brush every nook and cranny with a pastry brush or my fingers. It’s cleaner and there really is no sticking at all. 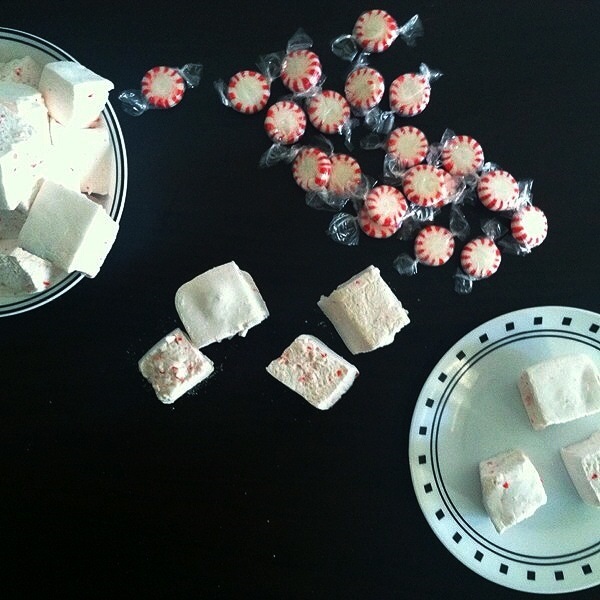 When it’s time to flip the marshmallow out of the pan and into the cornstarch/powdered sugar it just plops right out. Another helpful hint is to spray your spatula. Marshmallow wants to stick to everything; it’s so clingy! 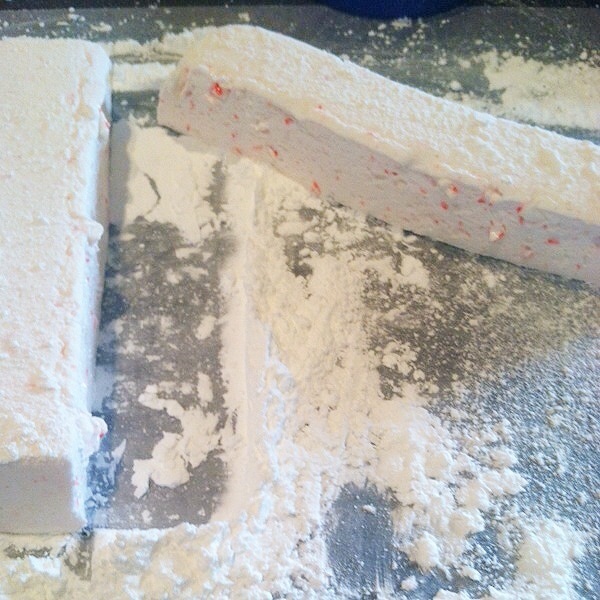 Spraying your spatula will help that not to happen and helps pouring out all the marshmallow easier. Fun Helpers: This is one of the best ways to cook with your kids. 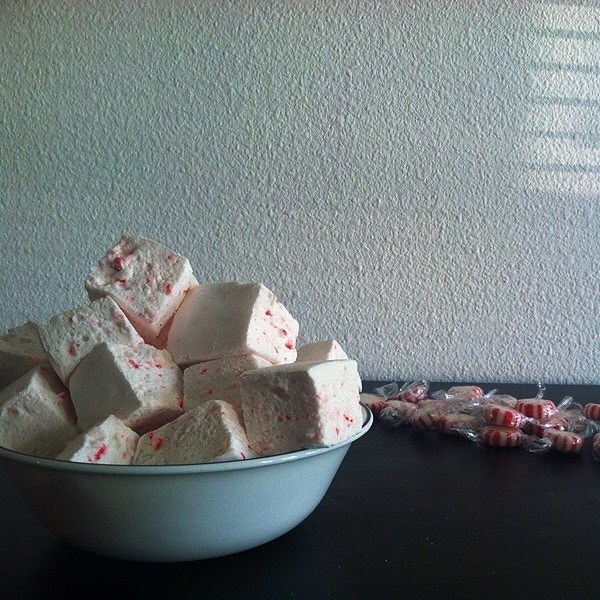 Older kids of course since this involves stove top cooking, but hammering the candies, mixing the marshmallow fluff, and scooping it onto the pan followed by cutting it and rolling it in the cornstarch/powdered sugar mixture is a blast and can be a great bonding experience. I know for a fact kids would love it because I’m a immature adult and I love it. Ta-Ta-For-Now: Well I’m off to live my boring holiday enriched life. This is an awesome and incredibly easy recipe to do for the holidays. It also makes a good sized batch! 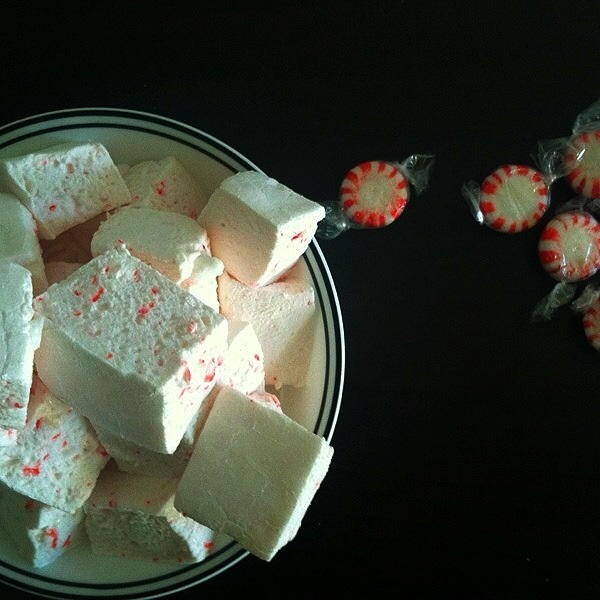 So having guest come over is a good way to show off your cooking skills and to get rid of some of it, unless your like my mother who tries to eat hers and other people’s peppermint marshmallow jars (that’s right Claire, I’m talking to you!). 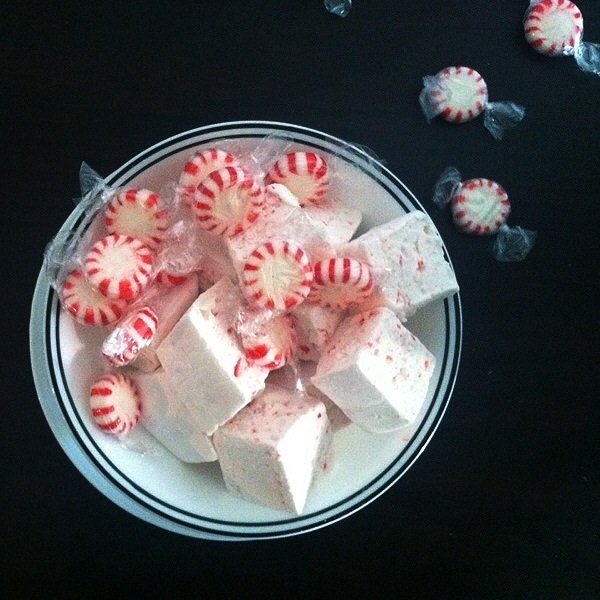 50 -60 peppermint (hard) candies or 20 – 30 candy canes. 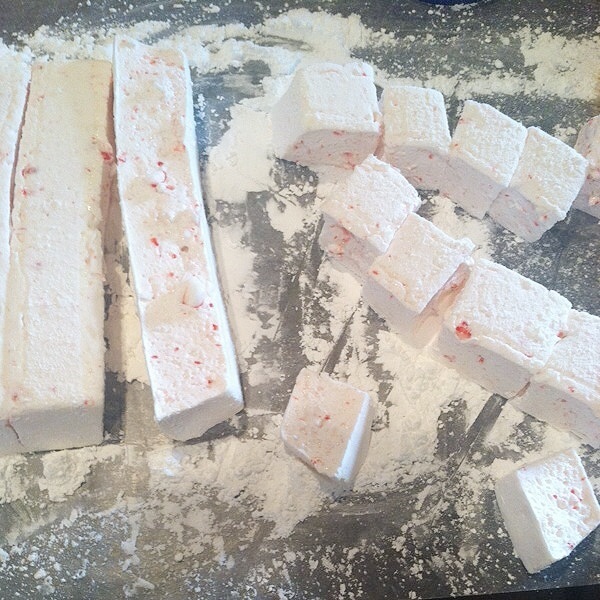 Smash the peppermint candies until they are small bites, most of them will be dust and there will be some chunks, just make sure that the chunks aren’t overly big, all small pieces. Place 1/2 cup of cold water in a small bowl, sprinkle the gelatin over it and stir to combine. Set aside to soften, at least 5 minutes. Place remaining 1/2 cup of water, the sugar and light corn syrup in a medium size saucepan and stir with heatproof spatula to combine. Bring the mixture to a boil, without stirring, over medium/high heat. Then reduce to medium heat and insert the candy thermometer and cook, uncovered until it reaches 240°F/116°C, about 10-12 minutes. Meanwhile, place the egg white in the bowl and with the hand mixer fitted with the attachment and beat on medium/high speed until they hold soft peaks, 6 to 8 minutes; turn the mixer off and proceed to next step. After temperature has been reached, remove pan from heat and pour the simple sugar mixture into the egg whites slowly (like a slow stream), it will start to look like meringue; add the gelatin and turn the hand mixer speed up to high, beating until the mixture is white, thick and almost tripled in volume and your once hot metal bowl will have cooled. 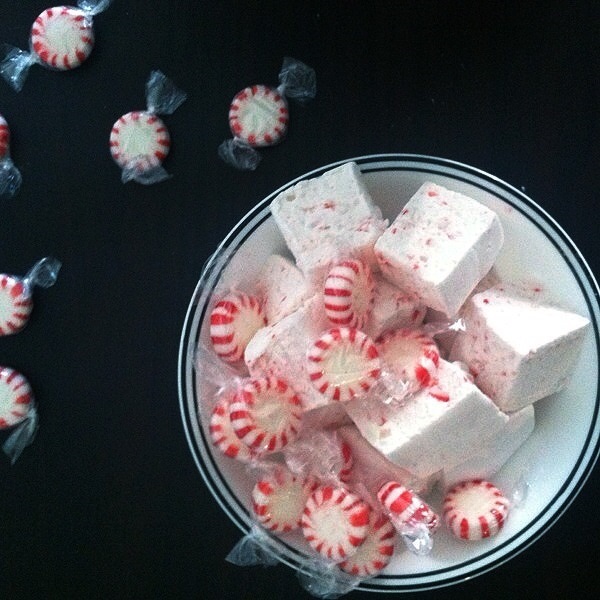 Add your peppermint candy and mix thoroughly with the hand mixer. This should take less than 30 seconds. The pour into greased pan using your greased spatula or pipe into desired design (like a candy cane!). Once fully set (anywhere from 6 hours to 8 hours) flip out of the pan and onto your powdered down surface of cornstarch and confectioners’ sugar. Spray your knife or other cutting tool with cooking spray and cut into desired shape, roll into powdered mixture again to make sure it is no longer sticky. Sift the excess powdered mixture off and enjoy! 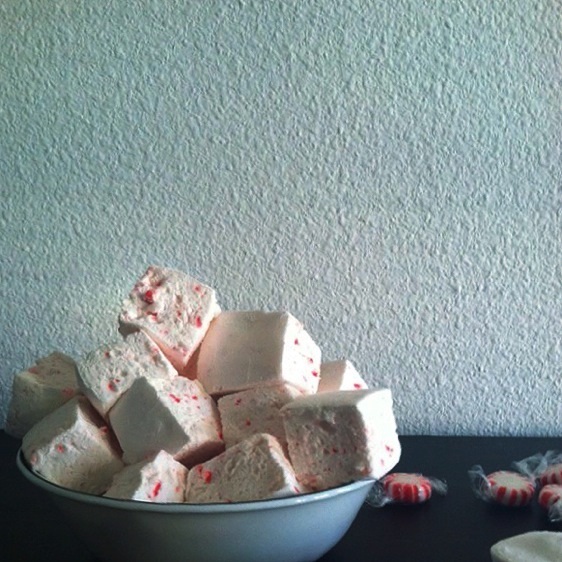 Do ahead: Marshmallows keep in an container with the lid loosely on top or a Ziplock bag unzipped room temperature for 1 week. Package It: This is cute to put in a jar, wrap a ribbon on it and given out as Christmas goodies!